Kevin Briggs came into kitchen and bath design by way of the construction trade and restaurant industry. While it may seem, at least on the surface, like a roundabout professional path, to Kevin it makes perfect sense. In many ways, he was on his way to becoming a designer all along. That solid background in building and hospitality, coupled with his passion for gourmet cooking and love of traveling, has helped Kevin hone his keen eye for design over the last three decades. What that means for Markraft clients is a kitchen or bathroom remodel that goes far beyond new color palettes and cabinetry. Kevin came to Wilmington – and to Markraft – about a year and a half ago. In search of warmer weather after a particularly cold winter in New England, he and his wife decided to relocate, and settled on southeastern North Carolina, an area the couple often visited for vacation. But Kevin’s experience extends far beyond his time at Markraft. He has a number of impressive credentials under his belt, including Certified Master Kitchen and Bath Designer with the National Kitchen and Bath Association and Certified Aging in Place Specialist and Certified Green Professional with the National Association of Home Builders. 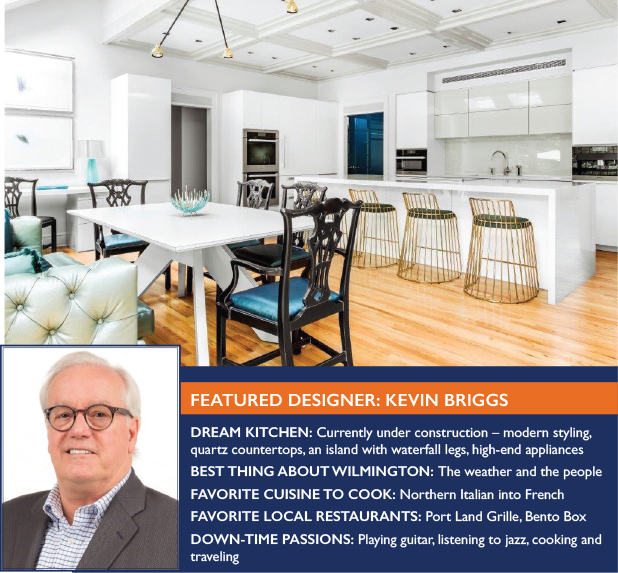 While he specializes in kitchens, bathrooms and home additions, Kevin feels a particular connection to cooking spaces. As a foodie, oenophile and experienced amateur chef, he knows the important role the kitchen plays in making a house really feel like a home. With his years of experience, Kevin can, of course, design in any style but that open feel – coupled with a chic aesthetic and practical detailing – is what he does best. “I really like a transitional and modern look that is clean, sleek and always very functional, and that is laid out in way that is enjoyable to use,” he said. It’s an approach to style influenced by his many travels, particularly to Europe, and his stops in cafes and restaurants off the beaten path. Now, as a local of Wilmington, Kevin feels quite at home with his new locale – and his work family at Markraft. Let Kevin Briggs and the other professional designers at Markraft share their expertise with you. The designers consult by appointment but drop-in visitors are always welcome to stop by and browse the showroom. The Markraft Design Center is open from 9 a.m. to 5 p.m., Monday through Friday, at 2705 Castle Creek Lane just off Castle Hayne Road. A Remodeling Dilemma: Kitchen Specialist Or Big-Box Store? Markraft Celebrates Its 30th Anniversary!